Joey Votto might have the most discerning eye in all of baseball, and this season he’s somehow made his own approach something even closer to perfect. Votto has swung at just 19% of pitches out of the strike zone, a rate which counts as especially low. At the same time, Votto has swung at 70% of pitches in the strike zone, a rate which counts as unusually high. When running discipline analysis, I like to compare those two rates. Votto has a swing-rate difference of 51 percentage points. It’s enormous. Joey Votto swings mostly at strikes. Chris Tillman has started five games since coming off the disabled list, and he’s thrown 452 pitches. When he’s thrown a pitch out of the zone, he’s gotten a swing 24% of the time. When he’s thrown a pitch in the zone, he’s gotten a swing 75% of the time. Tillman, therefore, is running a swing-rate difference of 51 percentage points. Hitters who’ve faced Chris Tillman to this point in 2017 have, on average, been about as disciplined as Joey Votto. Right away, you can tell that’s a problem. It’s a problem for Tillman, and so it’s a problem for the Orioles. The Orioles this year got off to a fast start, and that was while Tillman was sidelined. The optimistic spin back then was that the Orioles could get even stronger after welcoming back a good starter. Now both the Orioles and Tillman are stuck in a slump, and while Tillman himself isn’t solely responsible for the fate of the team, the Orioles need all the rotation help they can get. Tillman needs help before he can help his employer. Name an indicator. For Tillman, it’s a red flag. Recent DL stint? Tillman opened the year with a shoulder problem. Velocity? Tillman is down a few ticks. Fastball usage? Tillman is down more than a dozen ticks. Contact? Tillman’s gotten worse. Zone rate? Tillman’s gotten worse. He has one of the lowest strike rates in baseball. He’s worked ahead in the count at one of the lowest rates in baseball. Tillman has thrown a first-pitch strike — this isn’t a typo — to just 42% of his batters. He used to hang around in the upper 50s. That would stand as one of the very lowest first-pitch-strike rates on record. Everything has gone in the wrong direction. The only good sign is that Tillman is back to competitive pitching, but he hasn’t done his team any favors. In a sense, you can see how everything could follow from falling immediately behind. When a hitter’s in front, he can zero in on what he wants to attack, so all the numbers get worse. Yet that doesn’t explain the falling behind in the first place. Nor does it explain the missing zip. 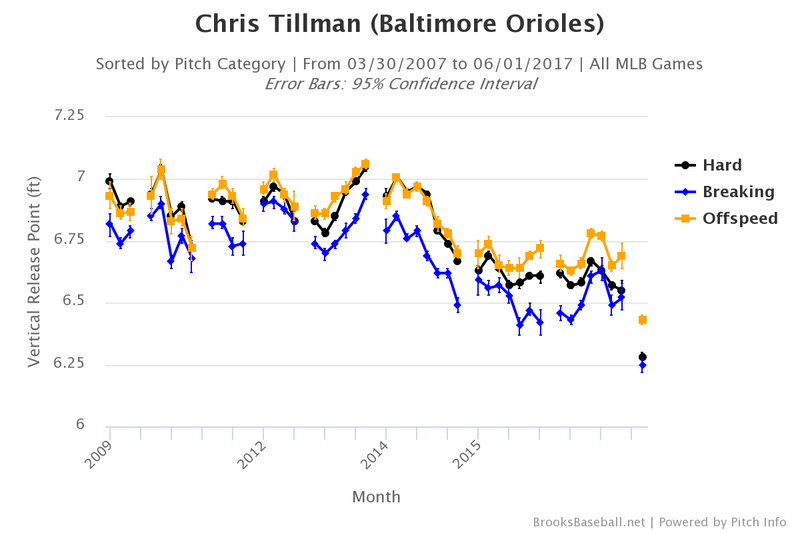 Statistically, Chris Tillman ain’t right. Which almost certainly means that, physically or mechanically, Chris Tillman ain’t right. I’ll say this for Tillman — he insists he feels okay. I have no alternative but to trust him, since I’m not a doctor. And, even if I were, I probably wouldn’t be Chris Tillman’s doctor. Tillman says his shoulder feels fine. He seems to suggest the problems are within his delivery. Now, Tillman opened the season on the DL with right shoulder bursitis. Last August, he went on the DL with right shoulder bursitis. Let’s just analyze what we can. One of the most interesting things here is how Tillman has backed off his heater. Now, it’s a worse heater, because it’s down a few miles, but Tillman last year threw fastballs 57% of the time. Tillman in 2017 stands at 44%, and he’s thrown fastballs at least half the time just once in five starts. It could, in theory, be intentional as a way to maximize usage of another weapon, but I don’t think that’s what’s happening. I think we’re seeing a lack of confidence, because we’re seeing a lack of control. 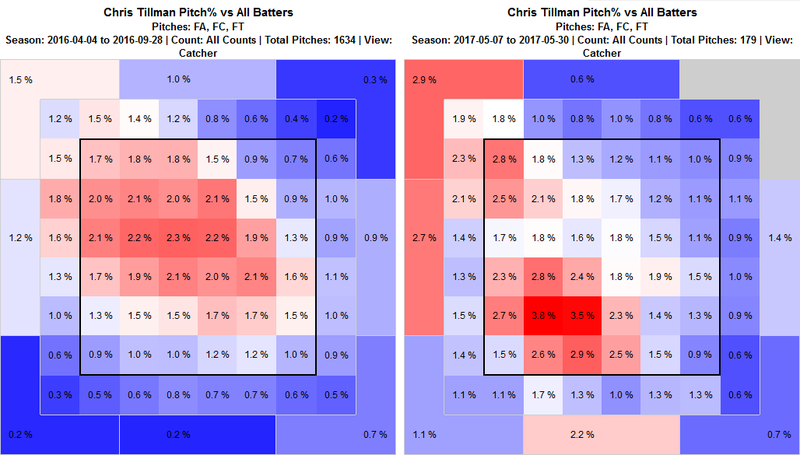 On the left, last year’s Tillman fastballs (and cutters). On the right, this year’s Tillman fastballs (and cutters). These images are from the catcher’s perspective. That’s 2016 on the left and 2017 on the right. 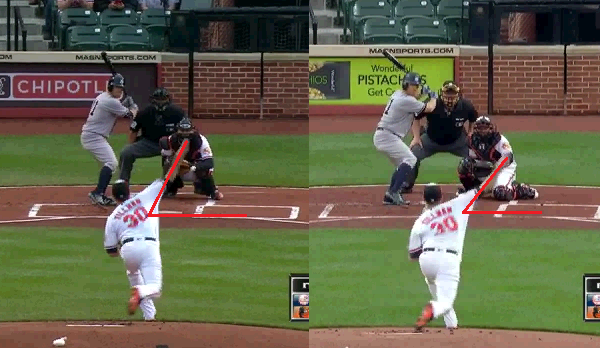 For one thing, Tillman’s right arm is showing at a different angle, implying a different arm slot. 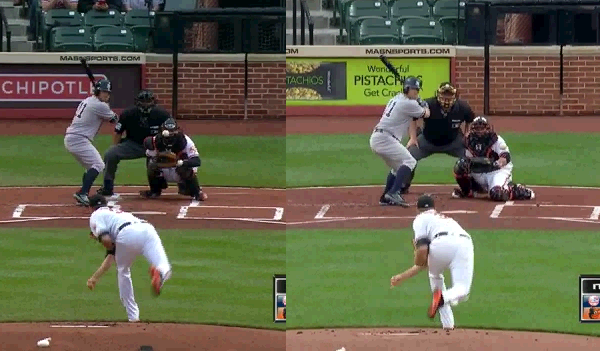 The way his arm is appearing on the right side there suggests that Tillman’s arm slot has been lowered. And then you can look at Tillman’s right foot. On the left, it’s plenty more off the ground, and it’s also swung over to the right. Tillman, in 2016, threw more directly toward home. Tillman, in 2017, has thrown more across his body. His energy hasn’t all gone in a line to the catcher. The numbers and the visuals both show a lower arm slot. That’s not the only thing happening, but it’s among the things happening. There are also seemingly issues with Tillman’s lower body. Maybe the latter is connected to the former. And, what do you think about when you see an arm-slot change? Every so often, it’s deliberate and helpful, like in the case of James Paxton. But a dropping arm slot is also thought of as a classic indication of a shoulder issue. Chris Tillman just had a shoulder issue! Again, Tillman says he’s physically fine these days. Let’s take him at his word. One explanation would be that Tillman’s shoulder is still bothering him. But another explanation would be that Tillman’s shoulder did bother him, before, and it caused him to adjust his mechanics, presumably not on purpose. Shoulder discomfort might’ve led to an accidental arm-angle drop, which could’ve been an attempt to compensate for the pain, and when muscle memory gets re-wired, it can take time to fix it. So my best possible guess right now, if Tillman isn’t still injured: It seems like the injury changed his delivery. He’s throwing more from the side than from over the top, and that’s just not who Tillman has been. His whole approach is based around having more of an over-the-top delivery, and this isn’t working out. As is always the case with guesses, I could be completely wrong. But if I’m right, then Tillman has work to do, during and in between his starts. The sooner he straightens this out, the better, for him, for his team, and for his future free-agency contract. Through five games, Chris Tillman hasn’t looked like himself. Consistent strikes and outs are going to be badly needed. Truth be told, they already are. We hoped you liked reading Chris Tillman Ain’t Right by Jeff Sullivan! Jeff, your scouting articles around the theme “What is this struggling player doing differently this year” are truly must-reads. This one hits the mark. On the pitch types, yes his fastballs/cutter have decreased in frequency. I’m not sure about whether the pitch classifiers are struggling with his lower velocity, or the movement with the arm slot is different, but he’s throwing much fewer 4 seemers in general. And his first strike percentage has dropped 15 points (from 57% to 42%). Hitters are unsurprisingly being more selective (selectively aggressive?) since they are ahead in the count.